I thought about posting this as a Friday Fun, but then if I did National Library Week would have been almost over, so I decided to post it today. If you are looking for the perfect gift for that special librarian in your life, check out The Bargainist Gift Guide for Librarians. Of course if none of those things hits there is always chocolate. Chocolate in the library staff area disappears faster than the library’s ACLS Provider Manuals. Of course if you are a librarian and you are looking for a little pick me up, try reading CNN’s article, Librarians: Masters of the info universe. It is written by Kerith Page McFadden, a UNC-Chapel Hill Librarian and talks about different librarians that you might not have known about. So Happy National Library Week! As a techie librarian who responsible for some of the section programs for this year’s annual meeting and as a co-chair for the 2012 meeting, Sarah has me wondering about MLA and other library conferences. Are we diverse enough? The library world has more women than men, and I like to think that we try and think about physical diversity (women, men, cultural, ethnic, etc.). But are we providing diverse enough speakers regarding their library background (hospital, academic, special medical, government, etc.)? Do we provide enough diversity in the program or is it too tech heavy, consumer health heavy, or reference heavy? Since I am librarian who likes to work with technology, I tend to focus and attend tech programs, but I do have other interests and I realize there are other librarians who are not as interested in technology. So in your opinion do medical library conferences (MLA, regional, local) have diverse topics and speakers, or are we trotting out the same people with the same topics? If you think we could be more diverse, then what are you looking for and in what ways can you think we can accomplish this? Let me know. Posted on April 5, 2011 April 4, 2011 Author KraftyLibrarianCategories MLA Events/News, Other Medical Library Stuff6 Comments on Diversity at Conferences? We have all heard about creating that all important elevator speech on the benefits of the library to institutional power players and others. Having a quick little speech is also helpful in regular social situations, being able to tell a person you just met at a party what you do without having their eyes glaze over or hearing another joke about the Dewey Decimal System is a nice thing. Your speech has got to be quick and to the point, yet convey a whole lot of meaning, because people are busy and they don’t have time to hear you wax poetically about the finer points of MeSH (plus we are probably the only people who know and care that MeSH is Medical Subject Headings not a woven fabric). Well the folks from the Cancer Librarians Section have created a video contest to showcase “tried and true” elevator speeches. Check out the details below (from MLANet). To encourage participation of those librarians who may or may not be able to attend MLA ’11, the program will include video submissions. While public services, reference, clinical medical librarians, informationists, library directors/managers, and other frontline people may be those who might normally use an “elevator speech,” think about ways you might send out a consistent message when answering questions on budgets, access issues, and anything else. Let those viewing the submissions know how well your message works! Videos submission will be accepted until February 11, 2011. A peer-review panel will judge the videos. The top nine videos submitted will be shown during the program session. All submitted videos that meet the length requirement will be available after the conference on the Cancer Librarians Section YouTube Channel. What will determine the top nine? At the program session, those attending will have the opportunity to vote for their favorite three videos. A combination of the peer review ranking score and the program session participation votes will determine three prizes that will be delivered after the meeting. Certificates of participation will be given to all those who submit a video that meets video guidelines. To submit a video complete the form and then email your video. If the form is not completed, then the video cannot be loaded to the mlacls2011 channel (due to legal issues). Videos must be received and the form completed by February 11, 2011. Videos must be no longer than three minutes. Elevator speeches should be no more than 30–60 seconds of the video. Spend the remaining time quickly describing the reception of your elevator speech. Videos must be in Apple QuickTime Movie .mov, AVI Format .avi, Windows Media Format .wmv, or MPEG Format .mpg or .mpeg formats. You can film your elevator speech and comments on your iPhone or other mobile device. Informal videos are fine but please ensure that there is adequate lighting and that you are clearly audible on the video. Videos over three minutes will not be reviewed for inclusion in either the 2011 MLA Cancer Librarians Program session or the Cancer Librarians YouTube Channel after MLA. We encourage larger libraries with many hospital and other smaller libraries around to host a Recording Day. University of Texas MD Anderson Cancer Center is encouraging librarians to bring their speeches and reflections to their research medical library on January 14, 2011. They will record the videos and give a copy of the video to the person. That individual will have to actually submit the video. However, keep in mind that the videos do not need to be studio productions. Good lighting and sound and meeting the other guidelines are the only technical requirements. The speech and how the message was received are the more important parts of the video judging criteria. Interested in learning more about revitalizing your message? Explore the resources on elevator speeches bookmarked at http://tinyurl.com/CLSMLA2011-Bookmarks. These resources include tools for creating an elevator speech and the positive and negative reasons for using an elevator speech. Want to see an elevator speech? View Julie Esparza’s elevator speech. She uses this message when new faculty, residents and medical students join the internal medicine team each month. If you have any questions feel free to contact Stephanie Fulton, chair-elect and program planner for the Cancer Librarians Section Program. So whip out those flip cams and upload your video to YouTube, you just might be able to score yourself a Nook while helping other librarians. 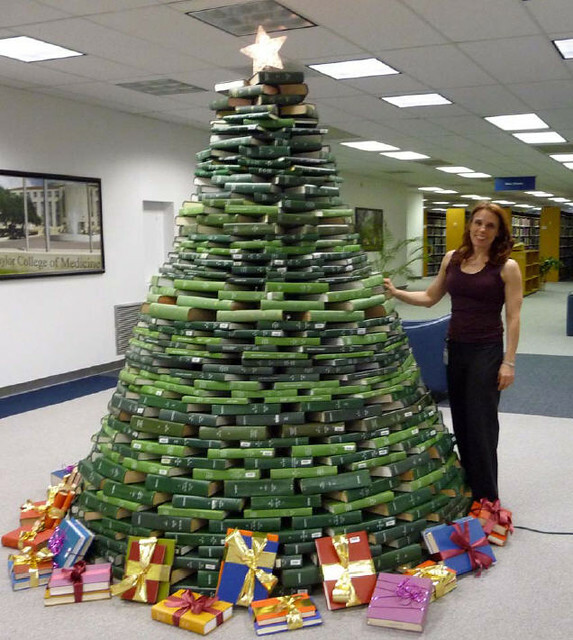 In case any of the librarians in your library want to get into the holiday spirit and are looking for something beyond holiday window clings, take a look at Texas Medical Center Library’s Bookmas Tree. They even have a “How To” guide available should you want to try it in your own library next year. Enjoy the holidays with family and friends, I will resume posting after the new year. Librarians, are you conducting any literature searches supporting systematic reviews or plan to conduct one in the near future? If so the reference librarians at the University of Pittsburgh Health Sciences Library System need your help and would like for you volunteer to participate in their study. If you are interested in participating in the study and helping out your fellow librarians as they conduct research, the results of which they hope to present at a meeting or publish in a peer reviewed journal, then please go to http://www.hsls.pitt.edu/services/reference/study for their contact information. Several librarians at my institution were interested in seeing/listening to the MeSH at 50 – 50th Anniversary of Medical Subject Headings by Robert Braude at NLM a few weeks ago. Unfortunately at the time, we couldn’t get it to work correctly for some reason. Good news, the program is now available under Past Events on the NIH’s videocast site. One of the librarians here has already viewed it and said that much of the talk is about “what was (and wasn’t) available/used BEFORE MeSH, and about the initial development of MeSH itself.” The program lasts about an hour and according the one viewer, there aren’t a lot of “visuals” so it is easy to listen to while multi-tasking at your desk. The NLM/AAHSL Leadership Fellows Program is “focused on preparing emerging leaders for the position of library director in academic health sciences libraries. Fellows will have the opportunity to develop their knowledge and skills in a variety of learning settings, including exposure to leadership in another environment.” Fellows are paired with academic health sciences library directors who will mentor them during the fellowship. Congratuations Tania P. Bardyn, Keith Cogdill, Kelly R. Gonzalez, Deborah Sibley, Susan Nash Simpson. Read more about the new fellows and their mentors and more information about the scholarship on the AAHSL web site.